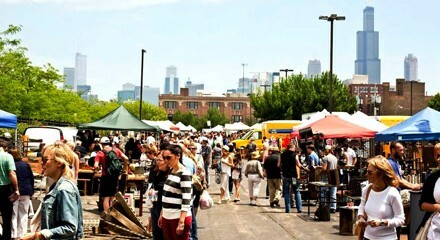 Eat, drink, and shop to your heart's desire at the first Randolph Street Market of the season. More than 150 vendors gather to sell vintage and indie wares that you didn't even know you needed. A live shopping soundtrack is provided by Dr. Feelgood, among others. Chicago's Memorial Day Parade is expected to attract 10,000 spectators who will pay their respects to our troops. The wreath-laying ceremony begins at 11 AM at Daley Plaza, one hour before this year's grand marshal, Lt. Col. Tammy Duckworth (congresswoman of Illinois's Eighth District), starts the march. Pianist Eric Reed plays the second of his three-night engagement at Jazz Showcase tonight with bassist Hamilton Price and drummer Wesley Anderson behind him. In Soundboard Peter Margasak writes, "Reed was already one of the most skilled and reliable mainstream pianists in the game, and he's not only become a more interesting arranger, he also seems looser and, yes, more adventurous as an improviser."